Enjoy Amino Energy any time! 100mg of caffeine to help increase mental focus & alertness. Packed with 5 g of micronised amino acids, including BCAAs. Enjoy any time! Each drink is just 29 kcal and sugar free. Our Essential Amino Energy delivers caffeine to help increase alertness and focus throughout your day, as well as essential amino acids. 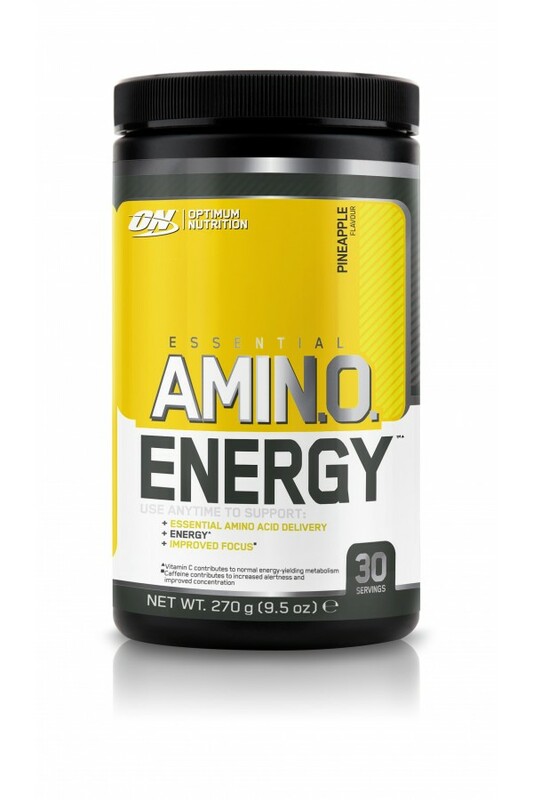 Essential Amino Energy always gives you the edge. It’s been specially formulated with 160 mg of caffeine, including green tea and green coffee extracts. Each great tasting drink is also packed with 5 g of micronised amino acids, including BCAAs. Delicious, sugar free and just 10 calories per serving! When Is The Best Time To Enjoy My Drink? Mix up Essential Amino Energy in your ON Shaker any time you’re looking to improve mental focus and alertness. It’s ideal in the morning when you’re planning to attack the day, for pre-workout priming, or as an afternoon booster! You can enjoy the drink by itself or stack it with your other favourite supplements. Check with a qualified health care professional before taking this product if you are pregnant or nursing a baby, under 18 years of age, have any known or suspected medical conditions, and/or if you are taking any prescription or OTC medications. Allergen Information: Contains soy (lecithin).